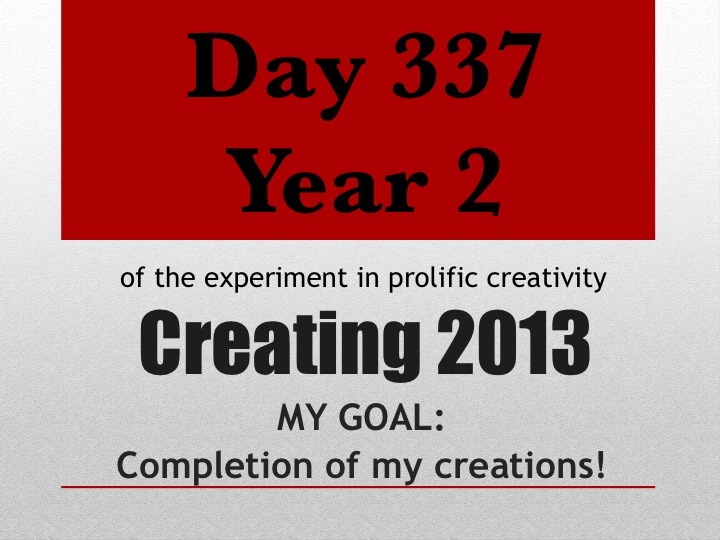 Day 337 Year 2: I set an intention for 2013 to be the year of completing my creations. To review: that’s none. Yes, things have moved forward—a lot. An hour has been shaved off of High School 911’s running time, we have a rough assembly of Collusions, I have a first words-on-paper draft of my script Death Over 3 Bottles of Wine which I just got great feedback on and I’m about to start another pass, and Screenwriter Cindy and I have been working like maniacs (and having a blast) the last two weeks to get her going on a rewrite of The Botox Party which she just started on the first act. But, is anything actually and totally complete? No. Surprisingly, I’m not completely freaked out by that fact. I stumbled across a post I’d written on Day 270: The Opposite of Sleep of my 2012 Yearlong Experiment in Prolific Creativity—Oh, what a hot mess I was! As I read it I had a visceral reaction. My body remembers the stress of that time like it was yesterday! But after the initial shell shock of going back to ‘Nam, I had to smile. Wow. How far I’ve come! At the time, I was struggling with whether to keep going with my aforementioned indie film Collusions or bag it and get a permanent tooth back in my head—long story. 67 days later—exactly a year ago from right now—by Day 337 of that year, I was in pre-production on that very film, sitting with my director and co-producer working on a shooting script. Obviously, I remained toothless and kept going. We shot it this past January. I fought a constant battle to get that f*cker filmed but I won the war and got it in the can. And now, it’s time to put my armor on again and go back to fighting—this time for post-production. I was naively hoping it wouldn’t be a struggle to get it finished this year but apparently, no matter what stage of creating something you’re in, it’s always a combat zone! I’ll spare you the bloody details but suffice it to say it reminds me of an Entourage episode with Billy Walsh on an island and “the suit.” I’ll never again rely on “good faith” language and not contractually specify a designated time period my director has to finish their cut and deliver it to me regardless of how big or small my budget is. But hey, I’m now a wily veteran where patience is concerned—although after almost a year it’s running thin—and, I’m reminded from unexpectedly revisiting Day 270 and Day 337 of my 2012 that creating is a process—a long, learning, circuitous one. Live and learn. Live and learn. But, push Collusions (and all of my projects) forward and get it done, I will. Whatever I have to do to make it happen, I will do. Victory will be mine! It is often necessary to become a warrior to win the battle of creative resistance—yours or the creative folks you hire—day in and day out in order to keep creating. I am a warrior for my creations! So are you. Let’s do this. Oorah! 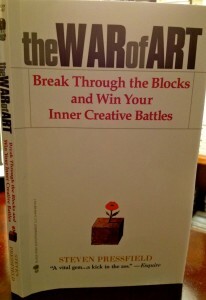 Until tomorrow, create from what you have…creative wars to win.